Akoma's Hound Heater dog house heaters are the industry standard, trusted by pet owners everywhere to keep their pets, hunting dogs, working dogs and other pets warm during the cold months. 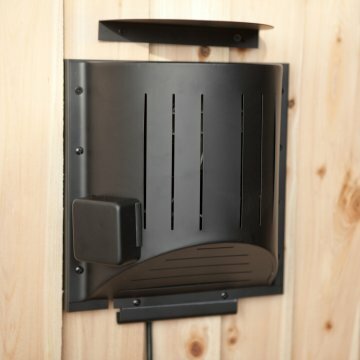 Energy efficient, safe and easy to install, Hound Heater dog house heaters are just what ou and your dog have been looking for. Thermometer-controlled. Just set it and forget it! Heats up to a 32 cu. ft. insulated house. The HHF-PC includes a "chew-proof" cord. The 8' heavy-duty power cord is protected by a stainless steel spring that covers the entire length. 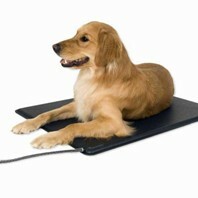 In addition to keeping your dog from chewing through it, it helps reduce cord tension problems. In a recent study published in Gun Dog Magazine and conducted at the Nestle Purina Pet Care Center, it was found that when housed outdoors, dogs require 7% more calories on average for each 10 degree drop in temperature! The study also said that hard-working dogs actually need 80% more food during colder weather than in the warm. Owners who use Hound Heaters dog house heaters feed their dogs roughly the same amount year around, which is good for the dogs and great for the pocketbook. They can be used in Igloo style houses - not just traditional wood or straight-sided houses. Mounting is virtually identical, except you use bolts and nuts to fasten the heater to the side of the house. The Hound Heaters stay cool, so there's no danger of melting the plastic Igloo homes.